I've been using the Best Spinner software for more than 2 years now and I haven't switched to any other software since then. It doesn't mean that I'm already happy with it, I am expecting some more improvement especially its database of synonyms. The Best Spinner is used in creating a new and unique rewritten article from an article, you can create multiple of new article from a single article using each words synonyms. As you may know, the article is considered unique when it's not 100% duplicate (obviously) so to solve the duplicate issue is to reconstruct the sentence, rewrite or use the synonyms of the word. To demonstrate to everyone the functionality and the use of the Best Spinner to make a new unique article that you can post on your blog (if you're a blogger) or want to use this to submit articles in order to build new links to your site. Here's the video I've made for everyone to give a better look and quick tour around the Best Spinner software that I've been using for years. 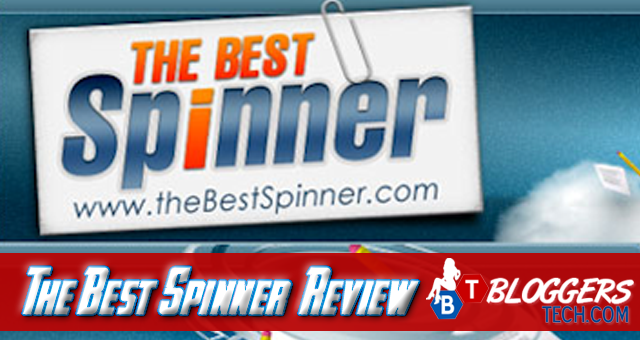 I think it's just right that I would give and post the Best Spinner review here on the Bloggers Tech blog, right? I give Jonathan Ledger a big bravo to the user interface of this software. But honestly, at first I didn't like the interface but that was the first design of the software and I am very much happy with the new one. I believe you've seen the video and quick tour, so as you can see everything is at its place and easy to navigate. The functions is very simple and I know it takes a hard work to gather the synonyms for each word and phrases, but hopefully they'll be able to update the database and correct some misspellings and words on the database which can be corrected. So I do hope, they could update the database and correct the words and synonyms in the database. There are also some bugs from time to time, but what's great about Jonathan Ledger is that he tries his best to update the software and entertain the bugs that have been reported by its users, which is really good. So if you've got problems go on and report it. So as mentioned above, the support of the team is good. I usually get a reply within 24 hours when I reported an issue through their ticket support. It's also best to include the screenshot of the error (if you have one) so that they'll be able to figure everything out why you're encountering such problem. All in all I would like to give the Best Spinner a total of 4.5 stars out 5, so yes the 0.5 is due to the database of synonyms. Will I suggest you to use the Best Spinner? Sure! It's worth it especially if you've got tons of articles out there and tired of manually rewriting the article, then the Best Spinner software will be totally useful for you. So for you to try out this excellent software by Jonathan Ledger, then just check out the buttons below for any discounts and offers that the Best Spinner software have. Try the Beset Spinner for $7 for a 7 day trial, Then $77 / year.